On June 2nd, 1946 the result of the institutional referendum stated the end the monarchy of the House of Savoy and the beginning of the republic, which was officially proclaimed on 18 June 1946. Enrico De Nicola was elected as the Republic's first President. Under the government led by Alcide De Gasperi, the first parliamentary assembly to be freely elected by the people began work on the new Constitutional Charter that was to come into force on 1 January 1948. On September 6th 1946 the Mint of Rome was authorized to produce the 1st series of coins from 1, 2, 5 and 10 liras, designed by Giuseppe Romagnoli and Pietro Giampaoli. These coins was used from December 21st 1946 up to 1953 and 1954. On April 1st 1950, the United Nations Organization authorized the Italian administration of the Somalia ("Amministrazione Fiduciaria Italiana della Somalia": AFIS), to lead the country to the independence from the British government in 1960. The mint of Rome produces a series of 5 coins with the value of 1, 5, 10 e 50 cents, and a 1 somalo. In 1951 Giuseppe Romagnoli designed the 2nd series of republican coins and in the same year the coins 1, 5 and 10 liras were minted; the 2 liras were minted in 1953, the 50 Liras in 1954, and the 100 liras in 1955. The minting of the 1 and 2 liras coins was suspended in 1959, due to the inflation. A new 20 liras coin was designed by Pietro Giampaoli in 1957, and on the same year the "Caravels" 500 liras silver coin was minted. 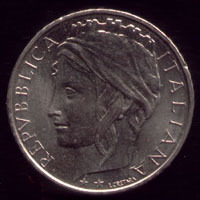 On the main face of the coin, Pietro Giampaoli represented a woman head with the symbols of the Italian regions; on the back side, Guido Veroi represented the Cristoforo Columbus caravels. The increasing price for the silver in the sixty years caused the ceasing of this currency in 1967. On 1976 a 200 liras coin was minted according to the design by Mario Vallucci. On 1982 the 500 liras bimetallic coin was minted; designed by Laura Cretara, it is made of an external ring in steel and a central part in bronze. On 1989, new 50 and 100 liras coins designed by Giuseppe Romagnoli with a reduced diameter were minted. Due to the problems caused by the too small size, on 1993 new 100 liras coins and on 1996 new 50 Liras coins designed by Laura Cretara was minted. On 1997 the 1000 liras bimetallic coin was minted; designed by Uliana Pernazza, it presents an outer part in bronze and an inner core in cupronichel. The minting of the Italian coins in lira were suspended in 1999, as a preliminary stage of the adoption of the euro on January 1st 2002.